How is it possible to get a verified badge for WhatsApp Business accounts? We have received so many questions about how to get a verified badge that authenticates the business account in WhatsApp, and today we want to clarify the situation. Everytime an user asked us how to get it, we indicated that the verification wasn’t possible, because the “WhatsApp business verification is currently limited to a small number of businesses participating in a pilot program”, in according to a FAQ available in the WhatsApp official website. 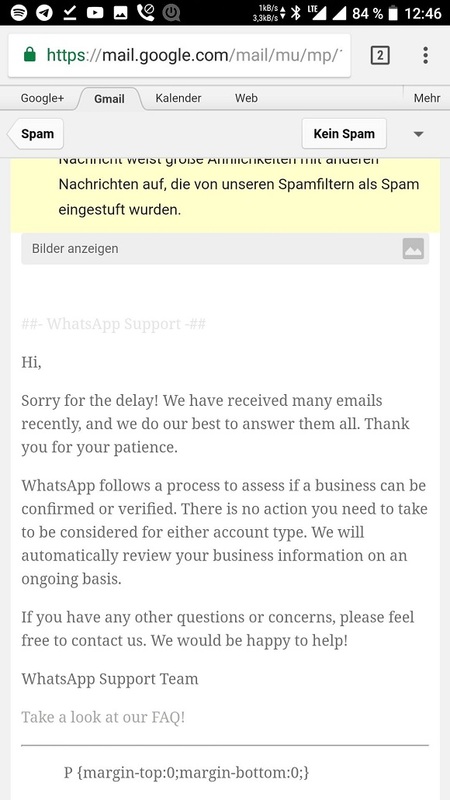 It’s strange that there is not a dedicated FAQ that explains better the situation, also because the pilot program should be done now, but today we have finally a more specific answer about the method that WhatsApp Business users should (or shouldn’t..) follow to get a verified badge. Recently, another follower on Twitter has contacted me to get more information about the procedure. I replied that it wasn’t possible in that moment, but I have recommended him to contact WhatsApp to ask more explanations.. In fact, who better than WhatsApp can give a correct answer? The most important part is: “WhatsApp follows a process to asses if a business can be confirmed or verified. There is no action you need to take to be considered for either account type. So it is clear that WhatsApp has some internal checks and they adopt an automatic process, that detects if a business can be really verified, so you have to do nothing to get the verified badge on WhatsApp: you mustn’t send a request to WhatsApp, you mustn’t ask them to have it and sending to them some documents that demonstrate that your business exists and it’s real is totally useless. Obviously, if you are a simple and normal user that has installed WhatsApp Business, don’t expect to get the verification for your account, seen that the verification badge identifies that a Business is verified, so it’s not for the user. And, for all existing WhatsApp Business users that have a verification level for their accounts: you will be able to modify the name of your company in WhatsApp, in future, but you will lose the verified badge for your account. Let us know on Twitter if you like the news and join our Telegram channel for fast posts and news notifications. • WhatsApp to improve the user experience in groups. • First Verified Business Accounts appear in WhatsApp. • WhatsApp is testing more options for image compression. Thanks Mario to report this information to us! Previous PostPrevious WhatsApp beta for Android 2.18.32: what’s new? Next PostNext WhatsApp Web 0.2.8299: what’s new?